Global warming is on a dangerous trajectory. Human-induced carbon dioxide pollution and deforestation are steadily increasing levels of atmospheric CO2 concentration which is resulting in, among other things, higher global average temperatures and extreme weather events. This article opines on the latest global warming data, mitigation policies, and the two major methods of carbon emissions quantification (production-based and consumption-based), particularly the synergies between consumption-based accounting and international trade. 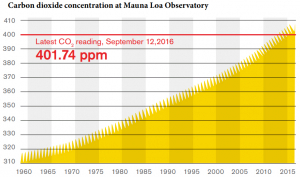 Dr. Charles Keeling of the Scripps Institution of Oceanography at the Mauna Loa Observatory in Hawaii began to measure the atmospheric CO2 concentration in 1958. 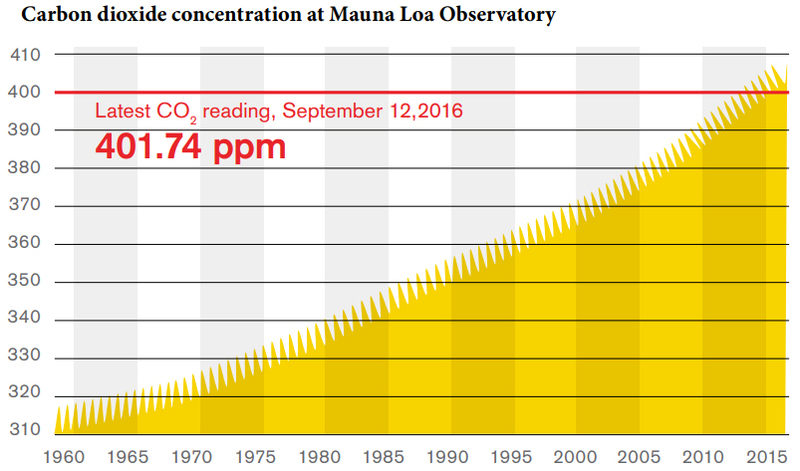 On 12 September 2016, the concentration of CO2 was 401.74 parts per million (ppm) in the sky above Hawaii; the chart below from Scripps reflects the rise in average annual atmospheric CO2 concentration from 1958 to 2016. The current levels of atmospheric CO2 concentration have increased by 43% from the approximate rate of 280 ppm in the 1880s (evidenced by carbon isotope analysis) when the inexorable escalation caused by human industrial activity began. The last time the Earth’s atmospheric carbon concentration was over 400 ppm was at least two million years ago – before humans existed! 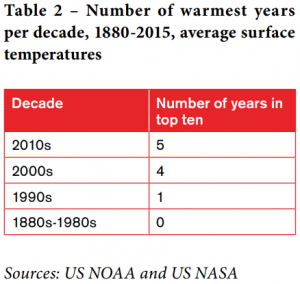 The United States (US) National Aeronautics and Space Administration (NASA) recently announced that in early 2016, global average temperatures reached a point approximately 1.3 degrees Celsius higher than pre-industrial levels. 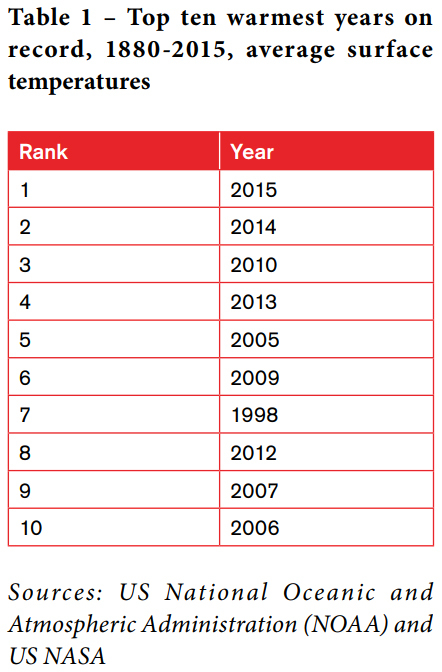 As reflected in Tables 1 and 2, nine of the top ten warmest years since at least 1880 have occurred in the 21st century. 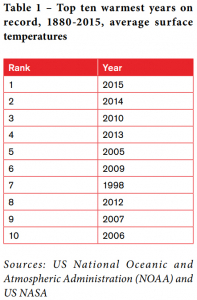 2015 is currently the warmest year on record, and 2016 is on track to become the warmest. While it should be only one of several global warming mitigation policies, governments of major emitters should signal a CO2 price so that carbon pollution becomes more expensive, and thus incentivizes conservation and transitions to low-carbon energies. The two general policy options for carbon pricing are a ‘carbon tax,’ and an ‘emissions trading system’ (ETS) which is also known as a ‘cap-and-trade’ system. In evaluating carbon pricing under both an ‘effectiveness’ and ‘efficiency’ criteria, a carbon tax is probably preferable to an ETS because it likely results in more consistent carbon prices that can be increased more easily when necessary. Under a ‘political feasibility’ criterion, however, an ETS is probably more acceptable to politicians and constituents, which is why most governments are choosing ETS. The performance of the largest ETS has been discouraging. The European Union’s (EU’s) ETS has experienced sharp volatility and sizable price declines. The extremely low price (4.38 euro per carbon ton on 1 August 2016) has largely been attributed to an oversupply of carbon allowances. More recently, this has been exacerbated by the long-term weakness of the EU’s economy, and fears concerning Brexit (the referendum of 23 June 2016, whereby British citizens voted to exit the EU). Accordingly, the EU ETS is failing to signal a potent and predictable carbon price to incentivize lower CO2 emissions. The traditional way to measure a nation’s carbon emissions is by calculating the total generated from within its national territory. Under this methodology, the carbon emissions from the production of goods that will become exports are allocated to the exporter country not the importer country where the goods are ultimately consumed or used. The United Nations Framework Convention on Climate Change (UNFCCC) and the IPCC have largely used this production-based accounting. Consumption-based accounting takes a different approach. Goods that are consumed but not produced in Country ‘A’ are allocated to Country A’s account, not Country ‘B’ where the goods were produced. Thus, the carbon emissions generated by the manufacture of goods in Country B but imported by Country A would be considered to be Country A’s carbon emissions. In other words, the carbon emissions resulting from the production of goods intended for international trade are allocated to the importing country not the exporting country. CO2 under this delineation is sometimes called ‘embodied carbon,’ which has been defined by Kejun, Cosbey, and Murphy (2008) as “carbon dioxide emitted at all stages of a good’s manufacturing process, from the mining of raw materials through the distribution process, to the final product provided to the consumer.” Consumption-based accounting and its implications are gaining prominence in academic fields too. Economist Christian Lininger’s 2015 book ‘Consumption-Based Approaches in International Climate Policy’ is a classic reference manual on this topic, and brings together the many strands of consumption-based accounting. Consumption-based accounting introduces an alternate method of quantifying carbon emissions by specifically incorporating international trade into the calculation. Moreover, it can reduce the ‘carbon emissions score’ of some large export-heavy nations, and increase the carbon emissions score of some large import-heavy nations. If an export-heavy nation is not credited with the carbon emissions triggered by their manufacture of goods that are purely intended for export, their carbon emissions score is lower. Carbon leakage is the concept that if a country adopts robust carbon mitigation policies (such as a carbon tax) unilaterally, industries with high-carbon emissions will then shift to countries that do not have similarly strong carbon pricing mechanisms. For instance, a steelmaker may shift its production from an abating (the one that is purposely and successfully reducing its CO2 emissions) country to a non-abating country, in order to enjoy more lax environmental laws and lower costs. Consequently, there would be no global reduction in carbon emissions; the volume has merely switched countries. Carbon leakage also raises several issues, including business competitiveness and climate mitigation policy. Regarding business competitiveness, carbon leakage could mean that high-carbon businesses will fail in an abating country, and similar businesses will thrive in a non-abating country. As for climate mitigation policy, global carbon emissions may not decrease because they have merely shifted from an abating country to a non-abating country. The government of an abating country may subsequently decide to act to dilute carbon leakage in order to keep certain manufacturers in their country, and ostensibly to lower global carbon emissions. Conceptually, although it has not happened yet, this could be pursued with carbon tariffs. In combination with carbon pricing, some countries might opt to implement carbon tariffs to reduce carbon leakage. Carbon tariffs predominantly, but not exclusively, entail a tax on the embodied carbon of imports. Partially because these actions could face World Trade Organization (WTO) adjudication, proponents frequently call them ‘border tax adjustments’ (BTAs), which are an acceptable equivalence mechanism under WTO law. Discernibly, carbon tariffs are controversial. Advocates contend that they will be necessary to incentivize countries with high carbon pollution and weak climate policies to change their ways, and that domestically they will be necessary to inoculate against accusations of harm to business competitiveness. Conversely, critics assert that they are merely another form of eco-protectionism. Some policy analysts are raising the profile of the still-unconventional notion of measuring CO2 emissions with consumption-based accounting rather than production-based accounting. Advocates suggest that it is a more accurate system, and would better incentivize CO2 abatement. Such an approach also draws from the perspective that international trade is both a contributor to global warming, and an intrinsic component in the many solutions that exist. Consequently, regardless of what policies are being adopted, and by whom, international trade and border management are being incorporated into the global warming policy framework.